Kheer is a traditional Indian dessert in which milk would be the main ingredient. The ingredients added to milk to make kheer varies. For instance rice could be added to milk to make Rice Kheer/Payasam. Other ingredients like saffron or crushed cardamom could be added for additional flavour. In Kerala this type of dessert is called Payasam and as coconuts grow in abundance in the state coconut milk is also used in preparing the dessert. This dessert is also made as an offering to gods during rituals or ceremonies or made at home during religious festivals. It also forms an important part of Kerala feast during religious festivals or weddings or other occasions) where different types of payasams mark the end of a feast. For those who arent familiar with Vermicilli-Vermicilli is like pasta but it is long and thin. The long strands of vermicilli are broken into small pieces about 1 1/2 inches long, stir fried in ghee and later added to boiled milk along with sugar and freshly crushed cardamoms. Different types of nuts, almonds or raisins also stir fried in ghee are added towards the end. The addition of freshly ground cardamoms gives an aromatic flavour to this dessert. This payasam is usually served with Boli which is a yellow coloured paper thin sweet pancake made of chickpea flour and all purpose flour. For equal amounts of sugar the sugar used here in US differs from what is used in India and is comparitively less sweet. Hence you may have to adjust the amount according to your taste. In a pan(I use round bottomed) heat 1 tbsp ghee at medium heat and fry cashews and almonds till golden brown. Drain and keep aside. In the remaining ghee fry raisins until they pop up. Drain and keep aside. Add 1 tbsp ghee to the same pan and fry vermicilli strands till golden brown at low-medium heat. Add milk and still maintaining heat at low-medium cook till vermicilli turns soft. When it has cooked add sugar, crushed cardamoms and mix well. 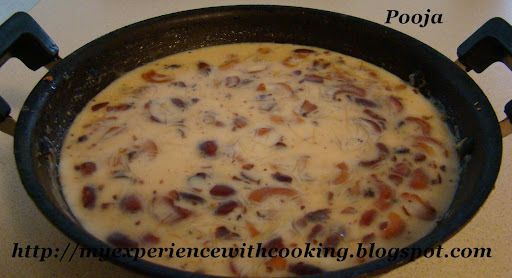 Add the fried nuts, raisins and condensed milk and keep stirring otherwise the condensed milk being heavier may settle at the bottom of the pan and get burned producing a burnt flavour! So always keep stirring. Increase heat to medium and stir till the payasam turns thick. Do not make it very thick at this stage because it would turn thick when kept for some time. Remove from heat. Nice effort.. and thanks for the recipe..